Michael Deibert's Haiti Blog: Haiti: time to take a second look? This blog aims to present an ever-expanding repository of links to news stories and other sources of information that will help readers determine the reality of present-day Haiti as they seek to help the country on its path to building a more just and equitable society. 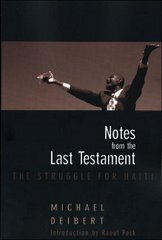 I will also post an expanding library of my own writings on Haiti from 2000 until the present. Despite the president’s enthusiasm, at first glance Haiti, a country of just under 11 million with a history of poverty and political instability, may seem a counterintuitive place for foreign investors to consider. However, the country actually boasts one of the lowest rates of violent crime in the Caribbean, two international airports (in the capital and in Cap-Haïtien on the northern coast) and, apart from a brief interim government, has been governed by elected presidents since 2006. The second independent republic in the Western Hemisphere after the US (having defeated the French in 1804), Haiti is making a renewed push for foreign investment. In February, the IMF signed an agreement with Haiti’s government, with the latter agreeing to “carry out economic and structural reforms to promote economic growth and stability, and alleviate poverty…[ and a] fiscal policy will focus on mobilising revenues and rationalising current expenditure, to make room for critical public investment in infrastructure, health, education and social services”. Earlier in 2018, the government set up the Autorité Nationale de Régulation du Secteur Énergétique to oversee the opening of the country’s system of production, distribution and sale of electrical energy previously overseen by the state-run Electricité d’Haiti. After years of maintaining an unspoken dual status with the US dollar, in March, Mr Moïse declared Haiti’s national currency, the gourde, as the sole legal currency for business in an effort to stem inflation. State investment agency the Centre de Facilitation des Investissements (CFI) is located in the capital’s Turgeau neighbourhood. The building is an atmospheric house in the gingerbread style of architecture, whose inside walls are covered with Haitian art and posters posing the question ‘Haiti: why not?’. But the country’s statistics are stark. According to the World Bank, Haiti’s GDP per capita hovers around the $846 mark, with more than 6 million people existing beneath the national poverty line of $2.41 per day. Earlier this year, the Banque de la République d’Haïti, the central bank, expressed concern about the country’s deficit, which is somewhere north of 3bn gourdes (more than $200m). Questions remain over how $2bn of money linked to the Venezuelan Petrocaribe fuel programme – overseen by Mr Moïse’s predecessors, Michel Martelly and the late René Préval – was spent. Some of the factors that have most adversely impacted Haiti’s economy have been external. In the early 1980s, a US-Canadian programme to stem the spread of African swine fever exterminated 1.2 million Creole pigs – a major contributor to Haiti’s peasant economy – and only haphazardly compensated owners. In the early 1990s, a US-led economic embargo imposed on the country to force a military junta from power devastated the country's middle class, dealing such a blow that the country’s GDP only regained pre-1991 levels in 2008. The decision by Haiti to reduce its tariff on imported rice from 50% to 3% in the mid-1990s then destroyed the ability of Haiti’s farmers to compete with cheap imported rice flowing into the country. However, these problems did not deter mobile phone giant Digicel, which launched a $130m investment in Haiti in 2006, the largest corporate investment ever made in the country by an international company. Nor did Haiti’s ills deter Dutch brewing giant Heineken, which purchased a 95% stake in the Brasserie Nationale d'Haïti (Brana) in 2011, and invested another $100m in 2014. Founded in 1975, in addition to Haiti’s signature beer, Prestige (often served so cold that ice coats the glass bottle), Brana also produces Guinness and various brands of bottled water and soft drinks. In addition to its 1400 employees, Brana now boasts a training centre and it partners local schools to train students finishing their studies to bring them into the company upon graduation. It is also updating and modernising its facilities, located in a sprawling industrial park just across the street from country’s main airport. Haiti can be a place of jarring contrasts. A fractious, sometimes explosive political culture co-exists with warm, gentle people. Desperately poor slums are found sometimes only a stone’s throw from elegant restaurants and shiny new hotels. Off the radar for years to many but the most adventurous, Haiti is now vying to come back in from the cold. Not all foreign investment in Haiti exists on a massive scale. Near the capital’s airport, the 25 full-time employees of the Deux Mains (“two hands” in French and a homophone of “tomorrow”) apparel company work in a series of containers situated around a bucolic courtyard. Founded by Julie Colombino, a relief worker who first came to Haiti after the devastating January 2010 earthquake, the company initially registered as a non-profit before registering as a for-profits enterprise in 2014 (the non-profit arm continues as Rebuild Globally). The company uses repurposed car tyres and inner tubes in nearly all its products, sourcing those and almost all its other raw materials in Hispaniola, the island Haiti shares with the Dominican Republic. Describing itself as an “ethical fashion company”, Deux Mains has attracted the attention of the likes of designer Kenneth Cole, who partnered with it to launch a limited edition sandal line, and the model Heide Lindgren, who began as a brand ambassador and now serves as an official adviser. Partnering with USAID’s local enterprise and value chain enhancement programme, the company – which sees 40% of its sales in the US and 60% in Haiti – is expanding into a 440-square-metre factory and adding 15 employees in order to produce its signature sandals, handbags and other goods through a combination of artisanal and industrial techniques. “There are several benefits that are available for a business in Haiti,” says Deux Mains vice-president Sarah Sandsted. “We have a hard-working, talented workforce here really eager for opportunity. Haiti is such a creatively inspiring place, and our products are more beautiful because we are in Haiti."